Chinadaily Forum › BBS › News Talk › Military Affairs › What are the targets that TRULY matter in WWIII? Yes, when I said cut the crap I was referring to the fact that you people were living in caves when Tibet and Taiwan were integral parts of China. So stop pulling wool over the ignoramuses' eyes! caves when Tibet and Taiwan were integral parts of China. If by "you people" you refer to western people as collective, then by the time the Qing conquered Tibet and other areas that now make some border regions of PRC, us people were already busy killing Native Americans in another continent - or liberating them from their savage ways, as it would have been justified at the time. But if you were referring just to me in person and my specific kin, then no - my country has no mountains nor major caves to live in. My ancestors cleared forest and swamps for farmland and towns. A branch of my lineage has been tracked from written documentation to beginning of 16th century, which would predate Qing invasion of Tibet by some 150 years. 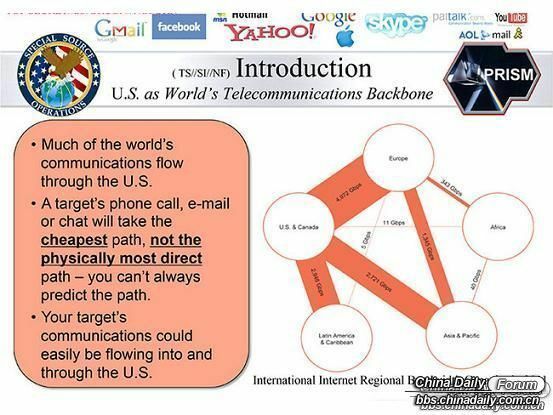 Worldwide global coordinated network of spying, listening and watching are truly matter in executing WWIII, such as "Five Eyes Family" of USA, Canada, Britain, Australia & New Zealand, and their collective effort by keeping the world firmly under their scheme of spying, listening and watching through extensive telecommunication network and secret Prism program. There ain't no such thing as IDEOLOGY in the heart & soul of Colonialist-turned Capitalist Imperialism, other than chasing and following the self-interest of greed & extraction of great wealth. Like I said, staying one step ahead of others, that's what matter for thy family, isn't it. Twentyfive percent out of nothing is still nothing! No hope for humanity if we can't avoid WWIII! My problem is simple: I just know better than everyone-else!